Bitcoin’s (COIN), (OTCQX:GBTC) meltdown continues. And it’s not just Bitcoin, other cryptocurrencies are actively crashing as well. At the time of writing this article Bitcoin is trading below $7,500, down by 7% on the session. But other digital assets are faring much worse, Ether is below $500, lower by 20% on the day. 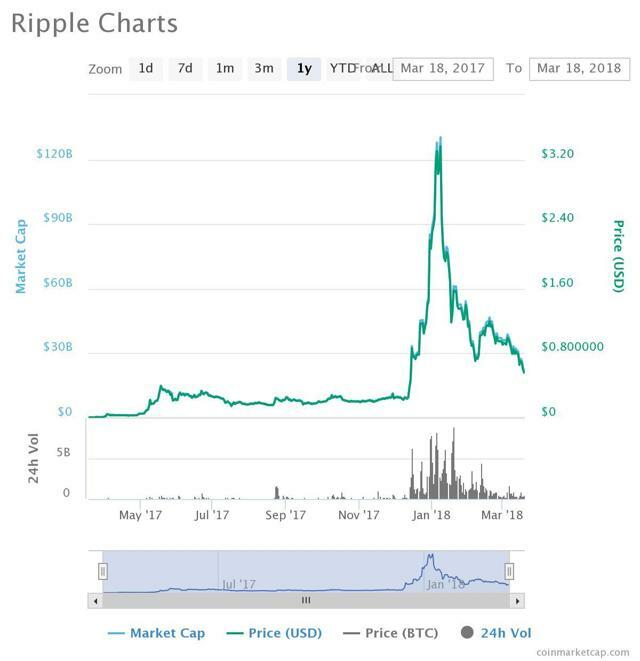 Ripple is below $0.55, down by more than 15% on the day, and has a market cap below $22 billion now. 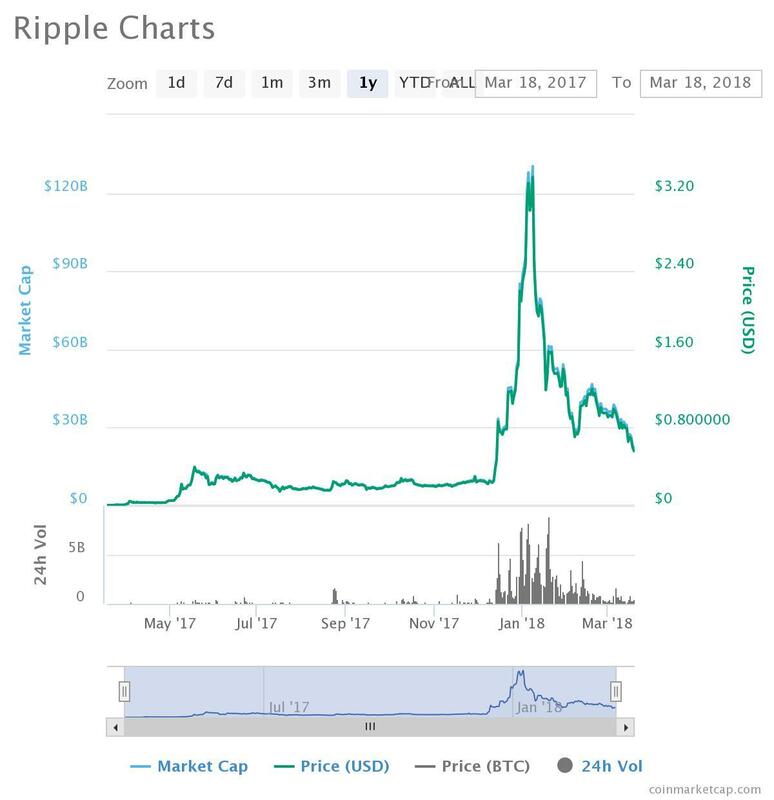 To put things in perspective the mighty Ripple was trading at a market cap of $145 billion, and at a price of around $3.75 just 10 weeks ago. 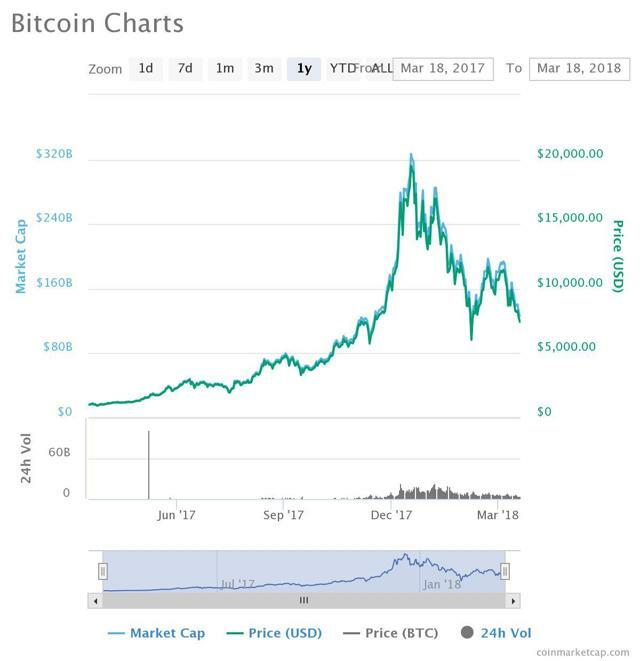 Source: CoinMarketCap.com – Bitcoin’s chart appears negative and the digital asset could break through next support at $6,000. While Bitcoin is down by nearly 65% from the high reached late last year, Ripple is down by a staggering 85% in 10 weeks, other cryptocurrencies are crashing by similar metrics, and the worst thing about it is that there appears to be no end in sight to the relentless selling. In total, the entire cryptocurrency complex has shed $555 billion since reaching a top less than 10 weeks ago, an astounding decline of 67%. Ripple’s 85% crash, are we near a bottom, or will the selloff get worse? 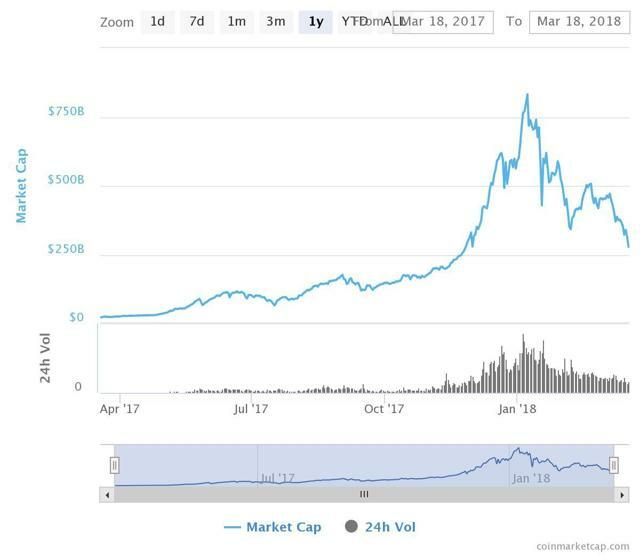 Cryptocurrency complex market cap broke through prior support, lower prices could lie ahead. So, what’s going on with Bitcoin and the overall cryptocurrency complex? What’s causing the persistent selling amongst the cryptos. Is this “still just a correction”, or is the air finally coming out of this bubble for good? Last week I wrote that Bitcoin was suffering due to a “perfect storm” of bearish developments that were ultimately culminating in the loss of popularity for the one time wildly favorable digital asset. Well, say hello to few more scary clouds now evident on Bitcoin’s horizon. According to Fundstrat’s research the breakeven cost for mining one Bitcoin is roughly $8,038. This is bad news for many miners as the price is well below this mark, and is threatening to stay below it for a while. Naturally, if it is no longer equitable to mine Bitcoin some miners, especially those operating in costlier markets will be forced to turn off their machines at some point. Source: CoinTelegraph.com – Bitcoin miners losing money. This is something you don’t hear everyday. What does this mean? Well, supply will slow, which should eventually be favorable to price. 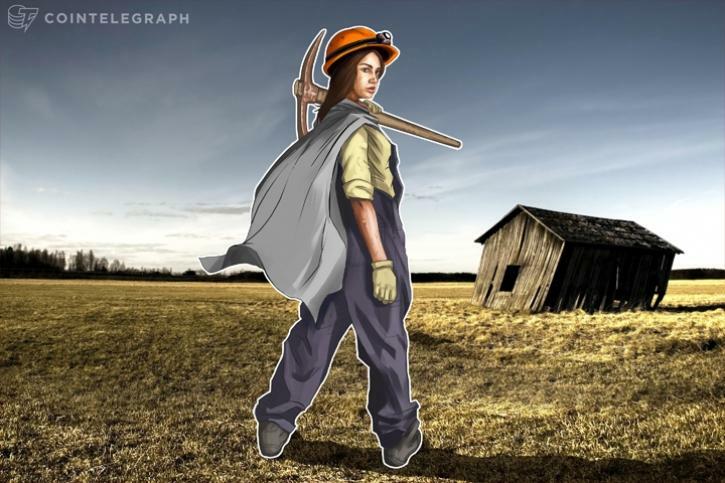 However, certain miners, especially in low cost producing nations can comfortably continue to mine at a profit until Bitcoin falls to $4,000 or lower. Therefore, there may be more downside in the short to intermediate term until the Bitcoin equilibrium is fully restored. First it was the Facebook ban, now it’s even worse, as the Google ban on cryptos is scheduled to take full effect in June. This is certainly a negative short term development for Bitcoin and the liquidity associated with the overall crypto market. Fewer ads means fewer people are likely to trade digital assets, and this comes on the back of a drop in popularity for Bitcoin and other coins as is. 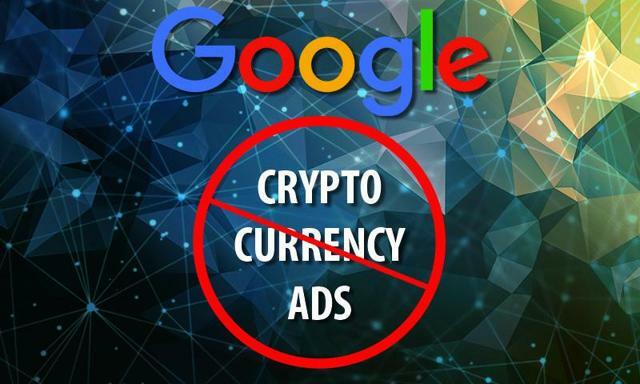 Source: BitcoinChaser.com – Google just saying NO to cryptocurrency ads. However, longer term this may actually turn out to be a positive factor for Bitcoin and the entire industry at large. After all, how often do you see adds to buy stock in Apple, or Microsoft? You probably don’t usually. Yes, you are aware of these companies because they exist and people will remain aware of Bitcoin because it exists. An overwhelming number of Bitcoin ads is actually what brought about the recent mania to reach a fever pitch. Also, many of the ads are associated with fraudulent activities, and are highly detrimental to the overall wellbeing of the market. Fewer ads should decrease the hype element surrounding Bitcoin and should enable for a more stable market to develop down the line. 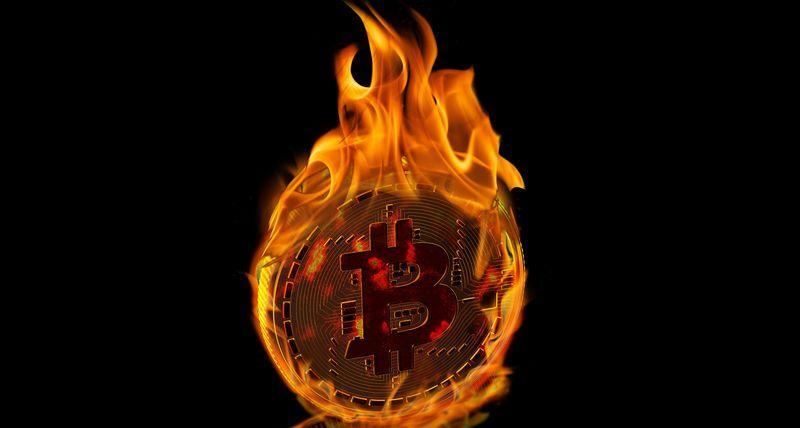 Nevertheless, these developments are not doing Bitcoin’s price any favors in the near term, and prices could continue to slump for some time considering this news, and other factors. 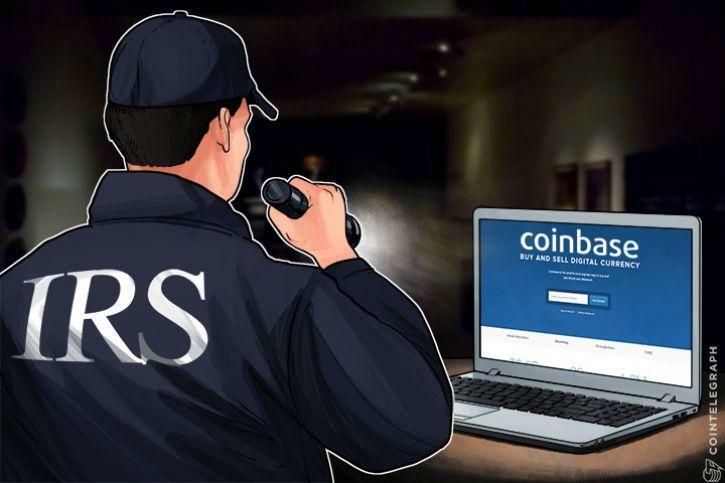 Apparently, the person had ended up with a $50,000 tax liability on trades after they sold $120,000 worth of bitcoin to buy different coins. And they are not alone, similar reports of IRS crackdowns are becoming widespread in the crypto world. Make no mistake, if you trade digital assets you better be very organized, and you better believe the IRS is coming for its cut. Unfortunately, with sagging Bitcoin confidence as it is, this is one development the Bitcoin community could have gone without. Nevertheless, here we are, another negative development likely to weigh on prices going forward. The Google and Facebook ad ban, tax issues, below breakeven mining prices, as well as other detrimental developments are adding to the overall apparent loss of popularity in Bitcoin and other digital assets. Moreover, these developments come on the back off SEC warnings, Japan’s clampdown, uncertainties about South Korea, ongoing security issues, and other negative elements coupled with a deteriorating technical image. It appears that the perfect storm against Bitcoin is gathering strength, and this bear market could last a while. I will try to end this article on a positive note. There may be an element of silver lining in all this. It is plausible that the overly negative news flow could shift towards a more positive tone in the second half of the year. It is also likely that once this bear market plays out, a new, robust leg higher awaits. I remain positive on Bitcoin and the cryptocurrency complex long term, despite the short-term difficulties that are likely to lead to lower prices in the immediate to intermediate term. Warning: Despite my optimistic long term view on Bitcoin, it remains a very speculative asset and could significantly drop in value in the short, intermediate, and long term. I remain long Bitcoin but it amounts to just 1.5% of my long portfolio. Moreover, I sold more than half of my position at significantly higher prices, and my current holdings are all profit. If things improve dramatically, I could see this position going back up towards 5%, including other digital assets. Whatever you do, please don’t take out a mortgage to buy Bitcoin. Note: SA has introduced a new feature. Hit the “Like” button if you enjoyed reading my article! Also, feel free to hit the “follow” link to receive updates about my future ideas. Thanks for reading! Disclosure: I am/we are long Bitcoin.